132 • RV PRO • March 2019 rv-pro.com B U S I N E S S Perish or Prosper? 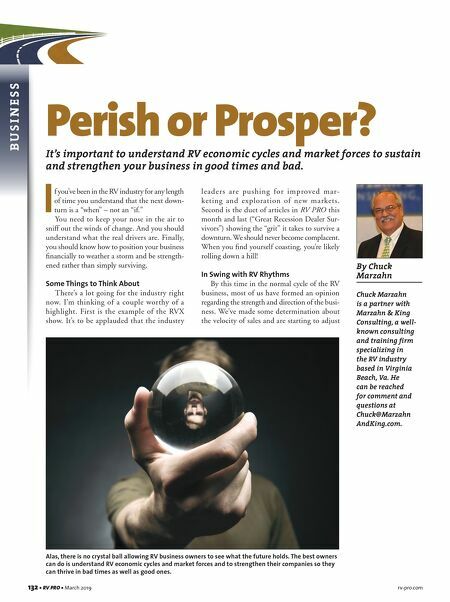 It's important to understand RV economic cycles and market forces to sustain and strengthen your business in good times and bad. I f you've been in the RV industry for any length of time you understand that the next down- turn is a "when" – not an "if." You need to keep your nose in the air to sniff out the winds of change. And you should understand what the real drivers are. Finally, you should know how to position your business financially to weather a storm and be strength- ened rather than simply surviving. Some Things to Think About There's a lot going for the industry right now. I'm thinking of a couple worthy of a highlight. First is the example of the RVX show. It's to be applauded that the industry l e a d e r s a re p u s h i n g f o r i m p rove d m a r - keting and exploration of new markets. 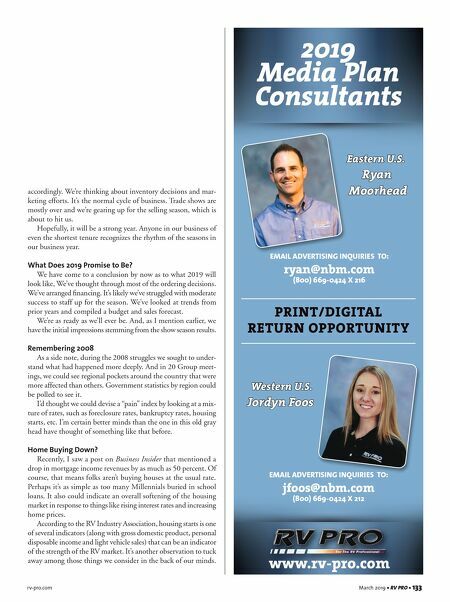 Second is the duet of articles in RV PRO this month and last ("Great Recession Dealer Sur- vivors") showing the "grit" it takes to survive a downturn. We should never become complacent. When you find yourself coasting, you're likely rolling down a hill! In Swing with RV Rhythms By this time in the normal cycle of the RV business, most of us have formed an opinion regarding the strength and direction of the busi- ness. We've made some determination about the velocity of sales and are starting to adjust Alas, there is no crystal ball allowing RV business owners to see what the future holds. The best owners can do is understand RV economic cycles and market forces and to strengthen their companies so they can thrive in bad times as well as good ones. By Chuck Marzahn Chuck Marzahn is a partner with Marzahn & King Consulting, a well- known consulting and training firm specializing in the RV industry based in Virginia Beach, Va. He can be reached for comment and questions at Chuck@Marzahn AndKing.com.